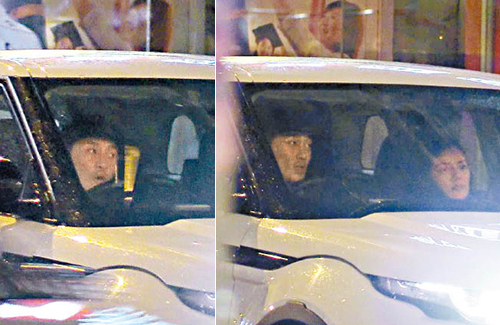 With his concert being only days away, Raymond Lam (林峯) must get as much rest as he possibly can. The actor and singer went under a “hell-like” training regime in the past month to shed pounds and build more muscle for his Hong Kong Coliseum concert. Raymond said he dropped 21 pounds—putting him at a mere 139 pounds. The 36-year-old said the last time he’s been this light was over 20 years ago. But even while busy preparing for the upcoming tour, Raymond still has not forgotten to set aside some free time for himself and his girlfriend, Karena Ng (吳千語). A few nights ago, the paparazzi spotted Raymond and Karena in front of a bank in Happy Valley. Although the couple live together, reports say Raymond has been living in a separate flat in the past few months so he could put himself in more austere conditions for the concert. Raymond waited inside his white Range Rover while Karena was withdrawing money from the ATM. Raymond was seen yawning, scratching his eyes, and slouching in his seat to a more comfortable resting position. He even closed his eyes for some quick rest. Having admitted that training is exhausting, it is not surprising to see Raymond in such a tired state. A few moments later, Karena stepped back into the car, looking miffed. Now wide awake, Raymond patiently listened to Karena while she ranted to him. Raymond then said a few words, which made Karena smile at last. Soon after, Raymond drove back to their home. Raymond’s Hong Kong Coliseum concert, Heart Attack LF Live in HK, will be held on April 29, April 30, and May 1. With his current condition, I hope he doesn’t faint during the concert… If you train so hard, you gotta eat too buddy! Not good for your body to lose so much weight for your height. And I don’t see that he got bulkier.. just look thin and old from the previous photos. good luck to him. Genuinely heartbroken. I understand the pressure he’s under to look good and to perform well but this just isn’t the way. Still, he’s only a couple of days away from his concert so there’s really not much to say other than to wish him good luck! He’s turned into a genuine old man! lol.. Even when he was younger and first came out people were saying how HANDSOME he was I never really thought so. Young and sunshine but HOT he is not, well not in my list anyway. I think the ones going to his concerts will be in for a shock. He has never been a hunk but just got promoted lots, therefore gaining fans. His acting is average and singing only accepted in a fully declined industry. Let’s say he won’t be filling in Tony Leung nor Andy Lau’s shoes when they retire. @jimmyszeto Tony or Andy?! Can’t even compare! @jimmyszeto but a young Andy and Tony was still very good looking imo. Raymond….nah. Haha. I think Raymond looks similar age to Andy right now…! Back in the 1980s, I’m sure many thought Felix Wong was good looking and Andy was not but things have changed in time. @jimmyszeto I also think he is highly overrated. I don’t really dislike him, but as you said his acting is average at best and his singing is mehh. Personally, he is not that hot either, but somehow he managed to get the favour and promoted a lot. @kiki He’s not handsome in my book either. Always thought he was blah. not really a good actor nor a great singer. But my mom loves him. ehehhe so beauty is in the eye of the beholder. When Raymond won the ‘most popular male singer’ it was as much as a farce as Grace winning ‘most improved actress’. Acting though, it’s good that he has left TVB because he gave absolutely everything and Michael Miu still outshone him. It would have been tough to show more improvement. @jimmyszeto his gaunt appearance isn’t helping him any in the looks department. his metro style these days make him look more sissy than macho. it’s a shame. i used to be/still sorta is, a fan. but his direction post drama “A Step into the Past,” has been nothing but disappointing. i blame TVB though, for typecasting him and allowing his “chok” appearance to override acting skills. some of it is his fault, but i still blame TVB more. @m0m0 Exactly my thoughts. The buff physique definitely looks more attractive and impressive than the look he’s currently going for. Ugh… I don’t understand his mentality.